Unmanned aerial vehicles are fast becoming a common part of the surveyor's tool kit. So what does it take to be able to use one? We sent novice pilot Evan Owen-Powell MRICS to find out. Drones are definitely set to play a key role in the future of surveying. That’s my firm conclusion after a day of flight training at the Aerial Academy in Norfolk, under the tutelage of director Elliott Corke. In terms of aerial imaging, and the potential use for surveyors, my day of multi-rotor flying opened my eyes to a world of future possibilities I could barely have imagined 24 hours previously. After a safety briefing, and run-down of the risks involved, we were on to the actual piloting remarkably quickly. A short demonstration, and I was soon not only in control of the drone, but already referring to it, like a pro, not as a UAV (unmanned aerial vehicle), but a UAS (unmanned aircraft system). Flying a drone is very intuitive, and only takes a short time to get used to the controls. After barely an hour I was able to hover the drone over a farm building, close enough to inspect the roof. Flying a drone is very intuitive, and only takes a short time to get used to the controls. 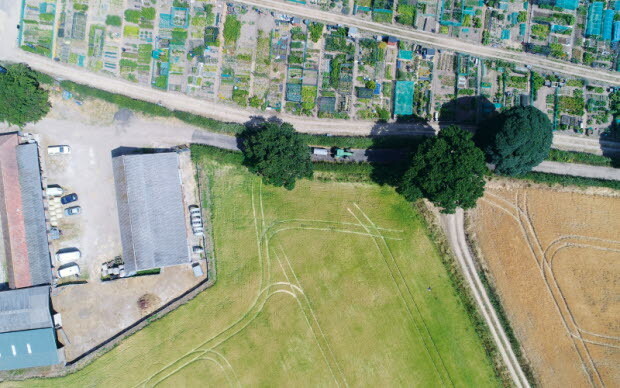 After barely an hour I was able to hover the drone over a farm building, close enough to inspect the roof – and usefully so, from a structural surveyor’s point of view. In fact, Corke estimates that it should take a modestly skilled prospective pilot around a day to become proficient enough to fly in a safe manner, respecting other aircraft and people on the ground, and to pass a flight test. I suspect that the generation of surveyors just below me, weaned on games consoles, will barely need tuition at all. So if even your humble correspondent can fly a drone, then you probably can, too. Even a lack of piloting skills is not necessarily a problem per se – a drone on autopilot flying a programmed route can take aerial photos and video with skill and precision. And with the latest drones coming equipped with collision avoidance technology, the risks and entry barriers to pilots are lowering all the time. However, Aerial Academy’s trainers are at pains to point out that the real skill lies in what to do when things go wrong – when the in-built GPS system fails, for example, and the drone starts to wander off on its own. In these cases, it is important to have a base layer of ability to fall back on – and this can take months of flying practice to perfect. Corke reckons he is still learning things to this day, in spite of what appears to be an encyclopedic knowledge. If acquiring the skill to pilot the UAV is not necessarily a barrier to surveyors, what of the statutory requirements? Here, things get a little more onerous, but by no means prohibitively so. 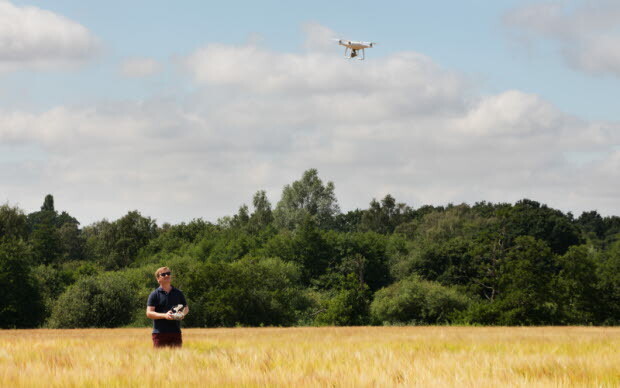 To fly a drone for commercial purposes, a surveyor needs a Permission for Commercial Operations (PfCO), which costs £247 from the UK’s Commercial Aviation Authority (CAA). This lasts for 12 months and takes approximately two days of theoretical training to obtain – including a flight assessment – and also requires insurance. Once you have demonstrated a sufficient understanding of aviation theory (airmanship, airspace, aviation law and good flying practice), developed procedures for conducting flights set out in your own Operations Manual, and passed a practical Operational Flight Assessment (the flight test) – then you are, essentially, good to go. 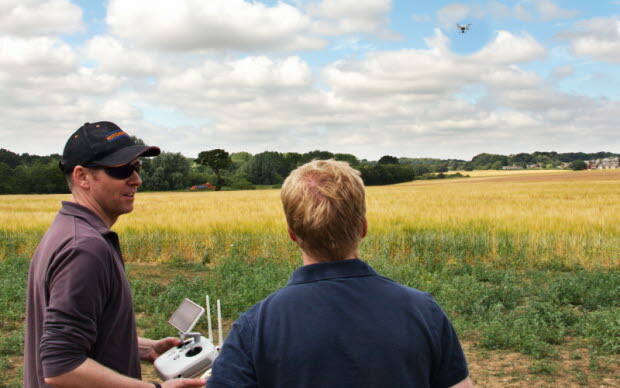 You can expect to pay at least £950 for a training course, while perfectly decent drones for commercial use start at around £1,200, so total start-up costs are surprisingly low. Novice pilot Evan Owen-Powell tries his hand at flying a drone: "the ability to inspect building elements up close, such as otherwise totally inaccessible flashings, is fantastic." I would emphasise two points here: first, flying a drone is enormous fun, but secondly and crucially, flying any drone commercially without a PfCO is completely illegal. This is important – if you do instruct a commercial drone operator, make absolutely certain that they are fully approved. So they’re relatively easy to pilot, and fairly affordable, but for the purpose of actually carrying out a survey, are drones any better than my 8m camera pole? Can they ever be as effective as simply climbing a ladder? After all, my ladder is relatively safe and simple to use – I put it up, and then send a junior surveyor up it. Well, on the evidence of my time spent with one – absolutely. I was able to inspect areas of a building that would otherwise be completely inaccessible – large roofs being an obvious example. And the standard 4k, ultra-high-definition camera gives absolutely superb detail. Combined with technology such as 3D imaging, they offer a seminal surveying tool. They are not without their risks and limitations, however. My flight training took place in a field on a farm – where the main risk was to inquisitive butterflies attempting to commit harakiri on the rotor blades. But in urban areas, within 150m of a congested area, substantial legislation kicks in and numerous risks have to be mitigated against. The CAA’s Air Navigation Order defines a congested area as being “any area of a city, town or settlement which is substantially used for residential, industrial, commercial or recreational purposes”. This would cover most areas in which a surveyor would work. 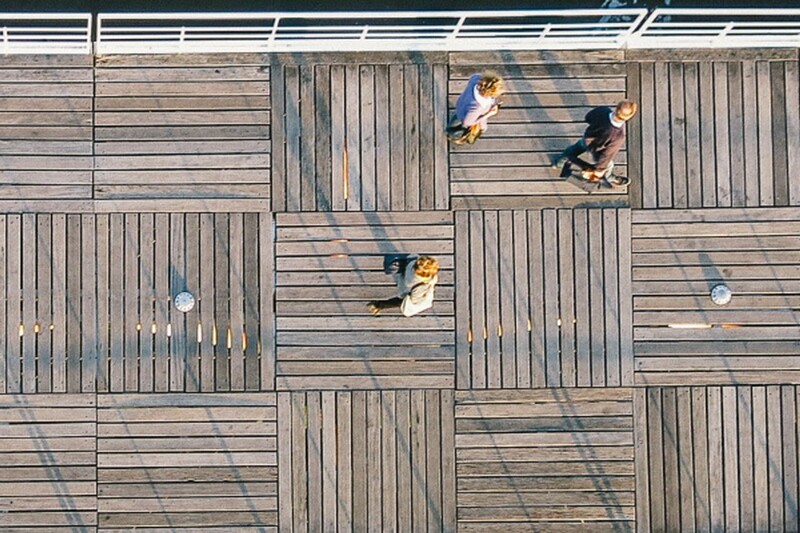 Risks cannot be taken lightly – there are numerous dangers to other people, structures, and not to mention places, if the drone does not perform as expected. The downsides are also potentially lethal – crashing a helicopter, for example. The team walked me through a recent roof survey they conducted in Norwich to demonstrate how they mitigate risk in cities – namely, by undertaking the survey in the early hours of the morning when fewer people are about. This is not necessarily a barrier for surveyors, but it might not, for example, be a feasible option for residential surveyors who undertake several surveys a day. Although setting up as a drone surveyor is a tempting prospect, the best opportunities at the moment, in my opinion, would be in hiring specialist drone surveying firms for large commercial surveys. The ability to inspect building elements up close, such as otherwise totally inaccessible flashings, is fantastic. A quick Google of the pricing structure also makes it a reasonable add-on option for commercial surveys. The industry is still very much in its infancy – it barely existed at all a few years ago, and the legislation is struggling to keep up – but the options for surveyors will grow as technology advances. Corke and his team are already providing crop monitoring for farmers, for example, and comprehensive aerial 3D imaging, using laser scanning. My practice is not quite there yet, but it won’t be long before I’ll be able to send a drone off to site and inspect a building from my desk. Until then, I’ll continue honing my piloting skills with a different type of remote control. Top Gun, anyone? 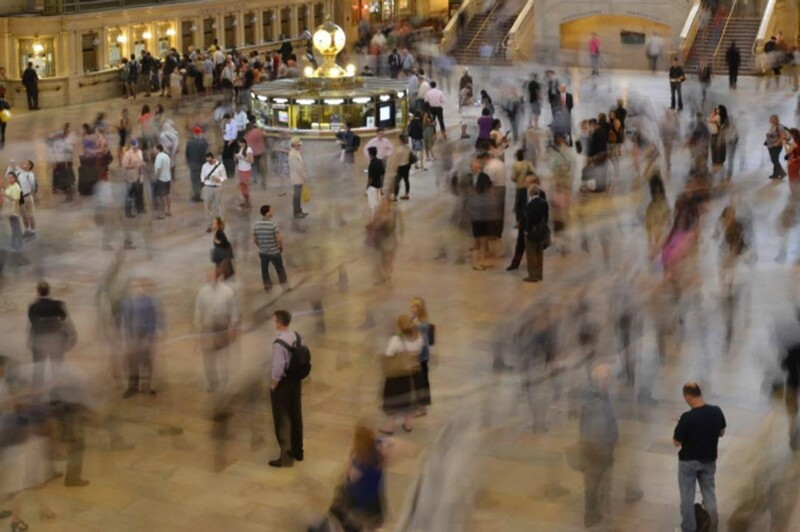 In terms of data sharing and control, the internet of things changes the game in important ways.